Have you ever experienced over exposure with a flash attached directly on the hot shoe of your camera? The Opteka FB-20 flash bracket will solve your problem. 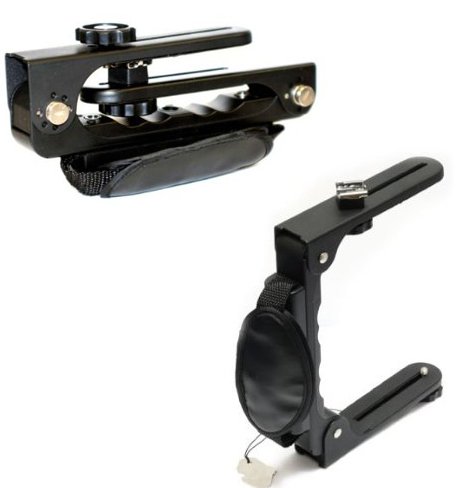 The Opteka Flash Bracket features two pivoting arms that keep your flash a variant distances from the camera lens. It can be adjusted to 90Âº, 120Âº and 270Âº. The adjustable head allows you to position your flash horizontally or in vertical positions. It allows your flash to rotate 360Âº for portrait or landscape photography. The arm is made of durable aluminum and at 21 ounces, very compact. This bracket also comes with a detachable hand strap. It fits comfortably around your hand and relieves stress on the wrist. Comes with a detachable hand strap. It fits comfortably around your hand and relieves stress on the wrist. Made of durable aluminum and at 21 ounces, very compact.